The UC San Diego Faith-Based Wellness Program has established a successful partnership with the Muslim communities of San Diego County. In collaboration with the Muslim American Society of San Diego and United Women of East Africa Support Team, UC San Diego Faith-Based Wellness Program developed a Food Waste poster to increase community awareness during the month of Ramadan. Americans waste 70 billion pounds of food each year while approximately 500,000 San Diegans struggle with food insecurity. This poster includes tips such as making a shopping list and using leftover ingredients. 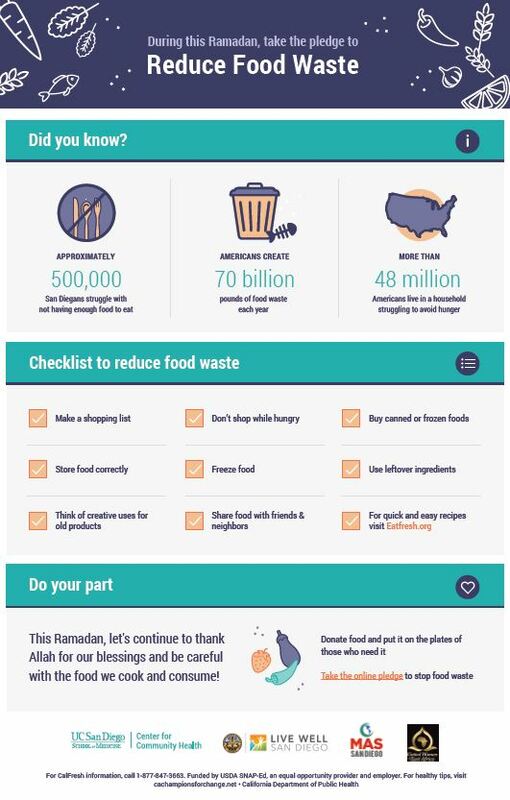 These efforts will allow community members to take a pledge and be committed to reduce food waste this Ramadan. Please take the PLEDGE! Previous Article: New Market Alert: Leon Produce in North Park Enrolled!